My Husband and I decided to visit Caliente for an early dinner this past Sunday. We arrived around 4:30 pm and were immediately greeted by Ivy who instructed us to choose a spot to sit. We decided on the patio. But before we even sat down, they brought us ice cold glasses of water and their house-made salsa and chips. 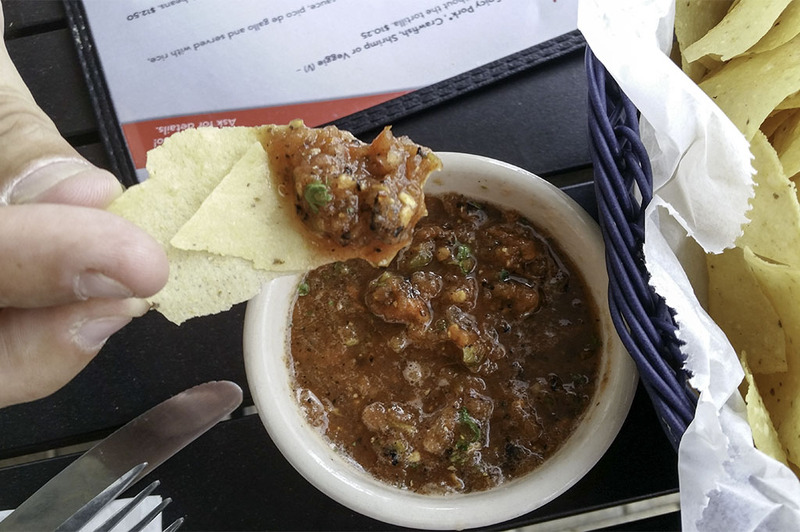 Their house-made salsa is amazing! Since I asked for lemon in my water, they were kind enough to bring out a small bowl with several wedges so I didn’t run out. Nice, extra touch! We looked over the menu and decided to order the Salsa Flight. My husband ordered a frozen margarita. The margarita was huge and a great value at $8 per drink! My husband said that it tasted as if he were in Margaritaville! In contrast, I decided to go with the Bella Glos Pinot Noir. Both paired very well with our entire meal. The Salsa Flight arrived in no time and the sauces were heavenly! The flight offered Habanero; Pina de Pica; New Mexico Green Sauce; Avocado Crema; and Sweet Habanero. We decided our favorites were the Pina de Pica and Avocado Crema. The Pina de Pica was so fresh and the onions just enhanced the fruit! The Avocado Crema had such a creamy texture and had just the right amount of avocado. All of the little bowls were empty by the time our dinner was over. At $5, this was an excellent value and provided lots of extra flavors. We took our time enjoying all the salsas and our drinks while we read over the menu. Everything sounded so good that it was hard to pick just one item! My husband decided to try one of their July specials. Every night after 4PM in July you can get Fajitas for four for only $35. Let me tell you, there is a ton of food with this deal! We knew we wanted to take home leftovers and this provided us with that wonderful benefit. 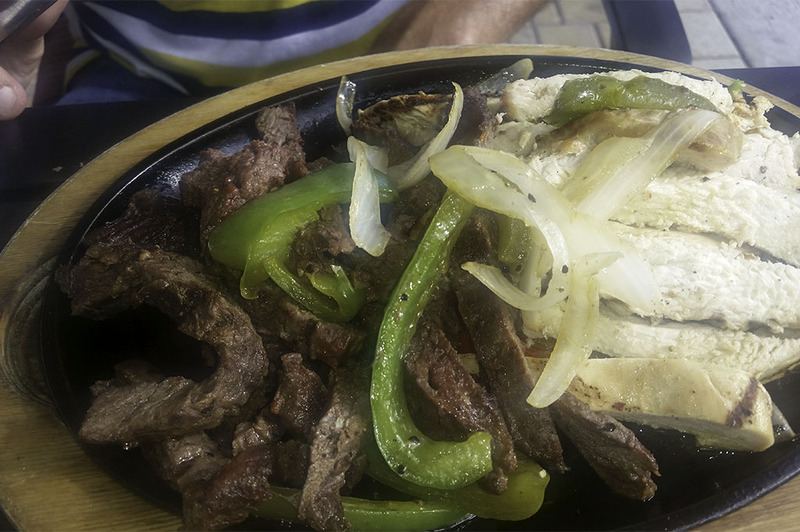 The meal came with a heaping pile of tender, juicy beef and chicken fajita meat mixed with green peppers and onions. The smell had our mouths watering in anticipation of that first bite! Accompanying all of this incredible meat were two very large bowls of cilantro rice, a bowl of charro beans, a bowl of refried beans, and house made flour tortillas. The tortillas were super thick – which proved to be necessary to hold all the fixings. The toppings provided were sour cream, pico de gallo, shredded cheese, and guacamole. Holy guacamole that stuff is addictive! I highly recommend getting this as an appetizer! It has just a hint of a spicy kick at the end and the flavors just burst. Truly delicious! I ordered the Grilled Tilapia. 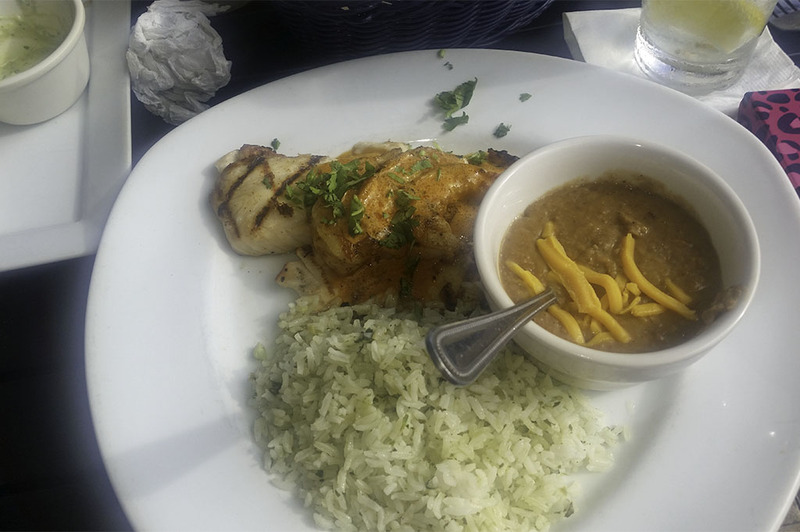 This was served with three grilled Diablo Shrimp and chipotle infused butter, cilantro rice and refried beans. The Diablo Shrimp were perfectly sautéed in the chipotle infused butter. 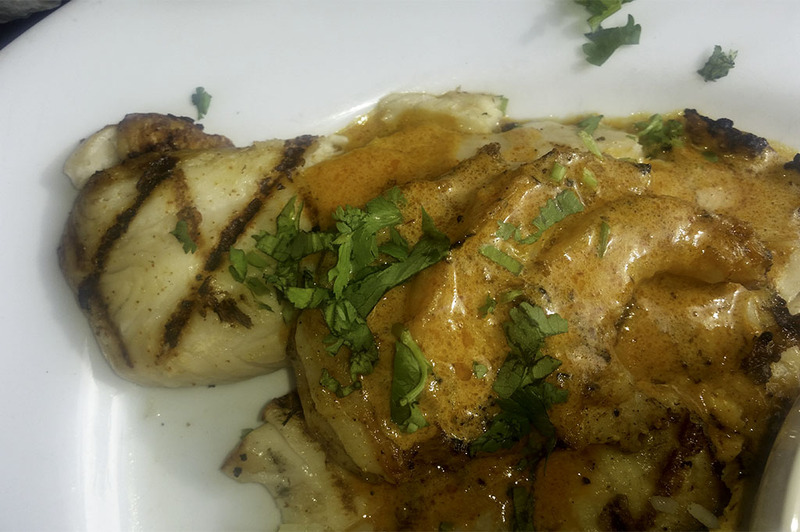 The Tilapia was so flaky and tender that I occasionally had trouble making it stay on my fork. It truly melted in my mouth. To me, this is Tilapia done right! The Cilantro rice went perfectly with this dish. I added a bit of that wonderful house salsa to my refried beans and it really enhanced their already scrumptious flavor. My husband had another frozen Margarita and I indulged in one more glass of the lovely pinot noir. We enjoyed our additional drinks while we savored all the flavors. I could literally live off of their cilantro rice and house salsa if I ever found myself stranded on a desert island. AND, we have fajitas for leftovers! Midnight snack perhaps? Bonus! As this was our first visit to Caliente, I need to thank Ms. Ivy for taking excellent care of us and being so amazingly attentive. Good luck in your upcoming Senior Year of High School this fall! I’m sure Chris knows what a Gem you are to his restaurant and Customers! If you haven’t visited Caliente yet or it’s just been a while since your last trip – do yourself a huge “flavor” and enjoy this yummy Tex-Mex spot! Side Note: If you park in the garage, Caliente will validate your ticket. Extra bonus treat!